AllyO is an AI-based end-to-end recruitment automation solution. We integrate with your ATS and operate it for you in line with your specific needs and requirements. For Workday Recruiting, we have developed and tested a Workday Studio integration that plugs in with your existing Workday Tenant. Do a few minor adjustments for your workflow and it is up and running with little effort or support from the HRIS team. We can support many use cases. Below is one example workflow. AllyO can provide value at each step of the process. Workday is one of the largest and fastest growing HCM solutions with significant market share and a product suite that spans a broad spectrum of Recruiting, HRIS, Learning, Payroll and other aspects of Employee journey. Customers who are adopting or have adopted a solution of this breadth have invested in building the right foundation and are often interested in how to now solve their biggest challenges around process inefficiency, inability to meet business goals and key stakeholder experience, which in the Recruiting world includes: Candidates, Recruiters, Hiring Managers and HR Leaders. Imagine having a digital assistant for all of these users which automates their rote tasks like screening or interview scheduling, while sharing data back and forth with their core foundational system – Workday. This now bridges the gap between daily efficiency and the desire to store and track all necessary information in one system. In this piece, we will share how such a vision has come to fruition for customers. In the plan jobs step, Hiring Managers and Recruiters input new job requisitions into Workday. Once the jobs are in the system, they are automatically sent to AllyO which adds the jobs into the system automatically. Candidates explore jobs either through AllyO or the career page. If they explore through AllyO, we help match them to a job, capture their basic information, create an account in Workday and create an application for that specific job. This makes the experience for the candidate seamless. When they log into Workday there is an application waiting for them to complete. Once they complete the application, AllyO is notified and proceeds to walk them through a screening or assessment process. AllyO’s engagement process is direct over mobile. This creates a convenient channel to keep the candidate engaged and allows AllyO to send reminders to complete the process if the candidate stops in the middle. The value is an increased application completion rate due to the integration between the two systems. Once a candidate completes the application and Workday notifies AllyO of the completion, AllyO reaches out directly to the candidate and sends them through additional screening questions that are configurable based on the job. If they come to a stop during the process, AllyO sends reminders to ensure the candidate is engaged and completes the process. This provides the value of a higher conversion of qualified candidates to move to the next step and to save time of recruiters for basic qualification. If a candidate fails screening, they can select a different job that they may be qualified for depending on their answers to the qualifiers. The benefit of this step is redirecting engaged candidates to the best job match for them. Once the screening is complete, AllyO updates the candidate record in Workday with the questions and answers as a record as well as updating the status of the candidate as screened or disqualified, etc. This makes it easy for recruiters to track progress in Workday. Once a candidate is screened, AllyO offers times to schedule an onsite or phone interview. When the candidate selects the slot they prefer, it will appear on the recruiter or hiring manager’s calendar. This saves significant time in trying to coordinate a scheduled slot with a candidate. Candidates are then reminded and confirmed before the interview. They can cancel or reschedule the interview by sending a response to AllyO. As a recruiter, this saves enormous time in coordination and reduces the possibility of No Shows. As the scheduling is completed, Workday is updated with status, so recruiters can easily see the candidates progressing through the process. Since AllyO knows both the interview times and candidate interview confirmations, it notes when an interview has occurred and moves the candidate to an interview completed step in the process and has the ability to collect interviewee feedback. This is available feedback and recruiters can continue to track progress. Once this part of the workflow is complete, control is handed back to Workday. Once an Offer is extended to a candidate and accepted, Workday notifies AllyO and if desired AllyO will send a message to the candidate congratulating them on the new position and reminding them to kickoff the background check. AllyO is then able to provide the link and a series of reminders. This improves the time to hire by making sure the candidates are completing their background checks in a timely manner. Once the background check is complete, candidates schedule their orientation, saving recruiters time in onboarding. Again, they can cancel or reschedule as needed. Once scheduled, it appears on their calendar. Status is updated in Workday to indicate they are ready to move forward. After onboarding is complete, AllyO is notified by Workday. Candidates are now New Hires and AllyO will reach out to them on a configurable time interval to check-in with them on their experience since joining the companies. Surveys are customized, collected, and the data is anonymized. HR leaders gain valuable information in the overall experience of new hires as they join the business as well as specific experience based on location. HR leaders can then take corrective action as needed and test different programs between locations or jobs. This is all in an effort to improve new employee experience and reduce turnover. Businesses increase efficiency and reduce the cost of training new employees which is at least $2000. 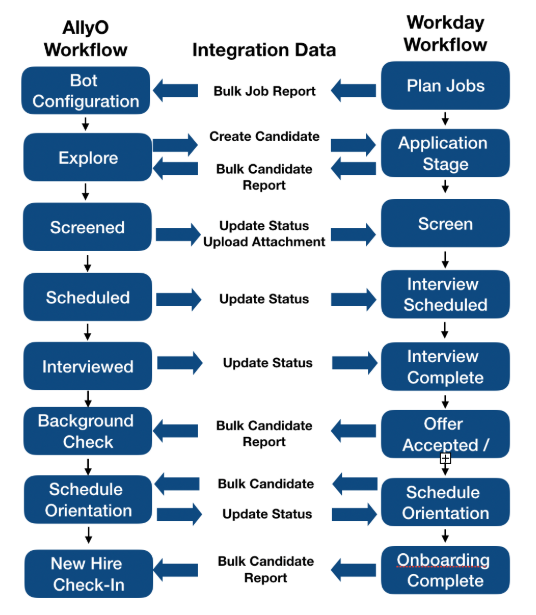 In summary, AllyO’s AI recruiting integration with Workday plus AllyO can provide significant value to the business in terms of efficiency and delight in the overall recruiting process not only for candidates, but also for recruiters, hiring managers, and interviewers.